The Last of the Mohicans! Wilhelm von Knyphausen (1716-1800) replaced Heister as commander of the Hesse-Kassel contingent in 1777, having arrived in 1776 as Heister's second in command. Both generals were old campaigners. Attwood, in his excellent study of the Hessians, notes that both Heister and Knyphausen were about 60 in 1776 as compared to Howe (52), Washington (44) and Clinton and Cornwallis (both 38). Knyphausen seems to have created a better impression that Heister and contemporary accounts show that he was held in higher regard (it was noted that Knyphausen enforced far stricter discipline). That is perhaps reflected in the fact that Knyphausen was allowed to command British soldiers and attend strategy planning briefings. At Brandywine in 1777 Knyphausen was given a division with which to keep Washington occupied at Chad's Ford whilst Cornwallis executed his wide flanking march to surprise Washington's right flank. Howe later reported that Knyphausen "kept the Enemy amused in the Course of the Day with Cannon, and the Appearance of Forcing the Ford, without intending to pass it, until the Attack upon the Enemy's Right, should take Place." 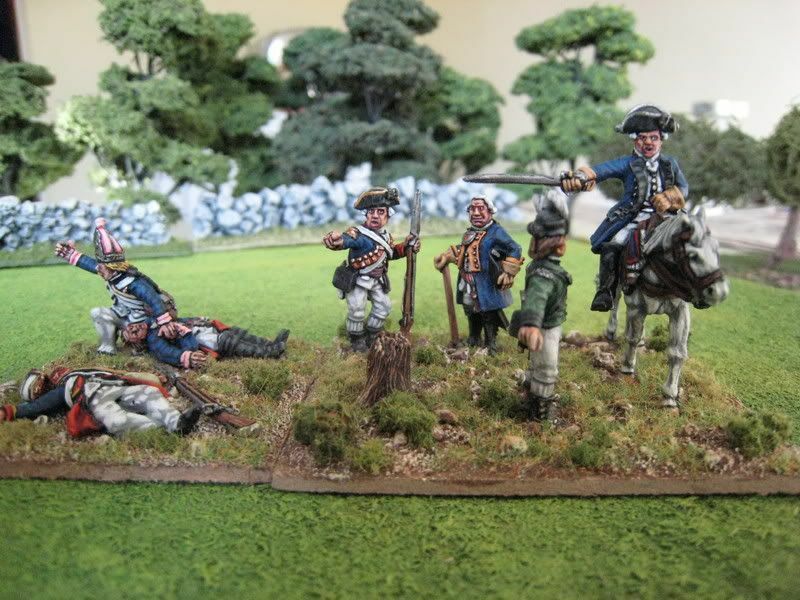 Washington was forced to transfer troops from Knyphausen's sector to that under attack from Cornwallis which then gave Knyphausen the opportunity to force Chad's Ford as Washington's position began to crumble. An expedition against American forces on New Jersey in June 1780 during Knyphausen's stint as commander in New York fared less well and achieved very little other than a propaganda coup for the Americans, who could report than the mission's only apparent purpose was to burn farms and kill civilians. Knyphausen regularly wrote to Friedrich II asking to be relieved and he was eventually recalled home in May 1782. 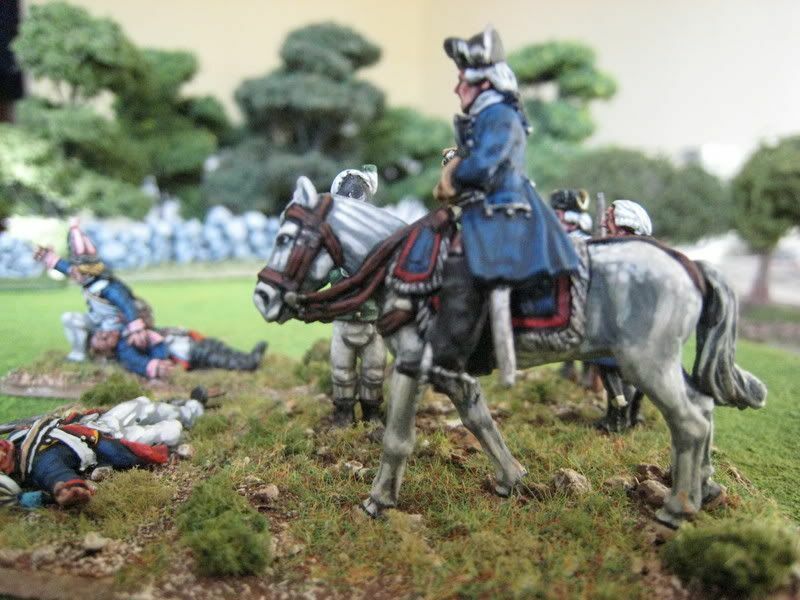 These figures here are a mixture of ranges and the vignette portrays Knyphausen as divisional commander at Brandywine, the others figures being taken from units under his control on that day. 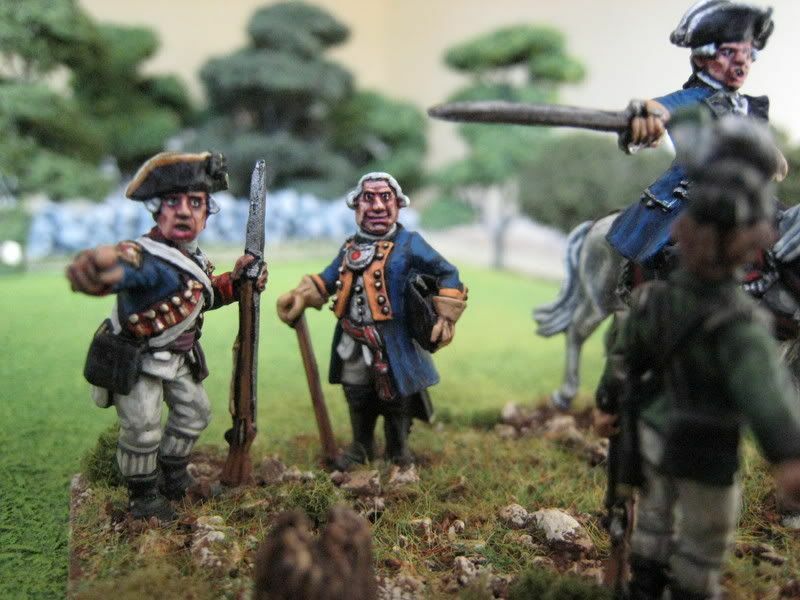 Knyphausen himself is from the Perry "Hessians Generals" pack and the Queen's Rangers officer he is talking to is also from the Perry range. The pointing figure is Foundry, painted as an officer from the Royal Artillery (a battery of which was attached to Knyphausen's division under the command of Brigadier Cleaveland, of whom I also have a vignette somewhere). 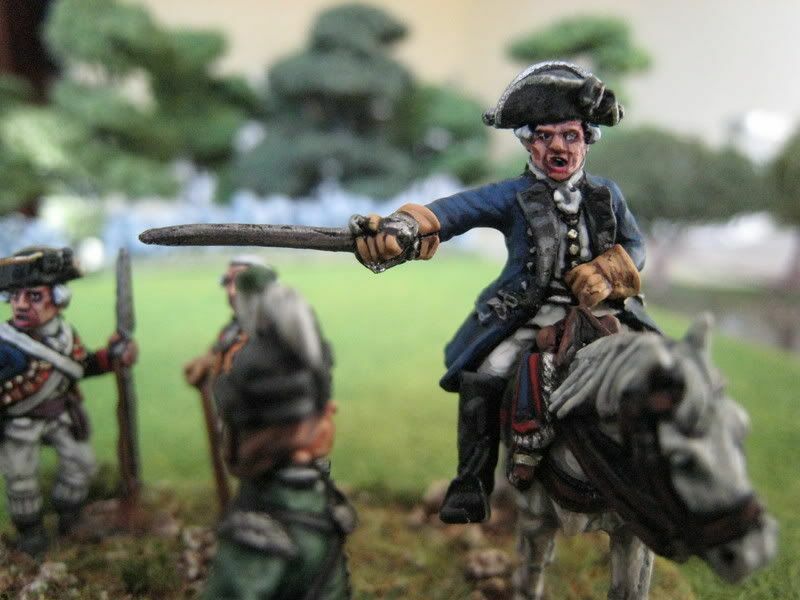 The grinning Hessian officer is a Mark Copplestone sculpt from Foundry's Seven Years' War range, painted in the orange facings of the von Lossberg regiment. The casualties (separately based) are more Perry figures, included here for decoration purposes only. These chaps are clearly excited about something - I like to think that this scene captures the moment when Knyphausen and his staff see Washington's troops rushing off to assist their right flank against Cornwallis' attack, so indicating to Knyphausen that he can really get stuck in and press home his own attack across Brandywine Creek. Painted January 2007.